BANGI, 6 June 2014 – The school holiday science camp organised by the Faculty of Science and Technology (FST) of The National University of Malaysia (UKM) for primary and secondary school children is to be made into an annual event. Vice Chancellor Prof Datuk Dr Noor Azlan Ghazali, who closed the camp today was impressed by the children’s enthusiasm that he suggested the science camp be expanded to include the social sciences as well. This year’s camp was attended by 120 children aged between 10 and 17 coming from as far as Kedah and Singapore, though initially more than 150 children were selected for the camp but due to the limited laboratory space and facilities only 120 were selected to attend the just completed camp. “We should expand it and set up a UKM Junior Club or its equivalent. We now have the science camp maybe in the next few years we can organise similar camps that focuses on certain social sciences subjects,” Prof Noor Azlan said. He said those completing the camp will be given certificates and those who complete the entire set of science and social sciences camps can be made certified UKM Junior members. 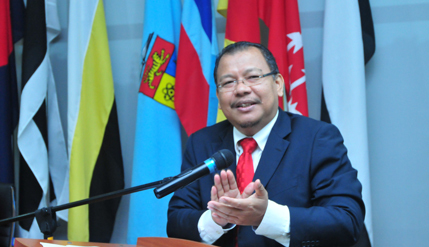 When they sign up to enter university and those selecting UKM as their choice can either be given extra merit or given priority as they have been part of UKM before, through the camps, Prof Noor Azlan said. Dean of the Faculty of Science and Technology (FST) Prof Dr Sahrim Hj Ahmad, who supported the idea of expanding the science camp suggested the use of more scientific laboratories in future camps. Head of Programme at the Centre of Chemical Science and Food Technology of FST Dr Rizafizah binti Othaman who also heads the Science Camp Programme Committee said the objective of the camp is to introduce the children to the wonders and excitement of science. “We want them to be enchanted by science again because there have been a steady decline in the number science students lately with more and more students opting for social sciences courses and subjects,” Dr Rizafizah said. The children were brought to see and use the science labs in FST to enable them to fully experience the science they were learning. The use of both Bahasa Melayu and English at the camp allows them to not only learn science in their preferred language but to teach them English as well. The theme for the science camp is science is fun using the word “Science-tastic”, to promote the fun of learning science. It is to remind not only the children but also the instructors that science is not such a serious matter as it can be experienced in a fun and light-hearted way. The just completed Camp was run by 19 volunteer instructors who are all post graduate students of FST, currently finishing their Masters or PhD courses. They are tasked with helping to guide the children and supervise their movements. Nurul Izzaty bt Khalid, a post graduate student studying Chemistry at FST was one of the UKM students who volunteered to help. The organisers hope the children will come back for next years’ Science Camp so that they can continue their learning as well as their relationship with UKM. The Science Camp lasted three days and included many activities and various learning points for the children, which they could bring back to school after their holidays.